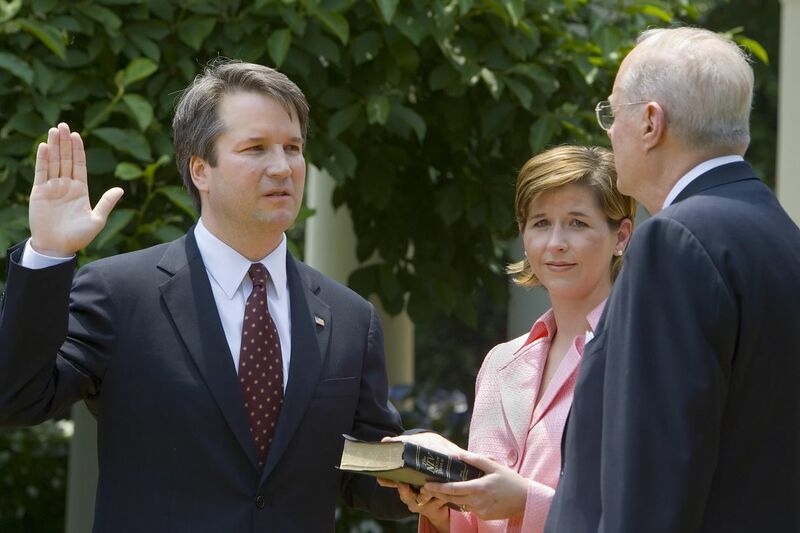 Last Monday night President Donald Trump nominated “originalist” Brett Michael Kavanaugh to fill the seat on the Supreme Court after Justice Anthony Kennedy announced his retirement after having served 30 years on the bench. Now having the chance to shift the High Court decidedly to the right for many generations to come no matter which political party holds the presidency in the intervening years, it’s important to remember that it is the Senate alone who will approve or disapprove Trump’s newest nominee. And while our side was able to get Neil Gorsuch approved thanks to some crossover Democrats, the question is can we do it again what with undeniable partisan politics seeming to have overtaken not only common sense but moral sense and decency as well. Avenge Obama for what…he served two terms as president per the time limits set by the Constitution… he nominated and got his people appointed to the Supreme Court…so what is she really avenging but Hillary Clinton’s loss thus proving herself to be but an aged snowflake still in need of a therapy puppy and bubbles…albeit this aged snowflake is an elected official of the most politically dangerous kind because her very words convey as truth what some of us have suspected all along…that Hillary Clinton was indeed to be Barack Hussein Obama’s third term in office. And with that third term surely would have come even more activist judges appointed to both the lower and the higher courts…hard to the left activist judges who would relish in legislating from the bench and who slowly but surely would be working hard to remove the ‘as-written’ Constitution…the very law of our land…by changing and amending it to such an extreme degree that it would have absolutely no relevancy at all in their eventually legislated socialist utopia. No longer relevant is truly what the Democrats want the Constitution to be for the simple fact is that with the decades long liberal leaning court now shifting hard to the right the Democrats simply cannot digest let alone accept both the economic and the political shocks they on the left received with the election of Donald J. Trump as America’s 45th president. So with the wise old adage that “elections do have consequences” not being the adage the Democrats wanted to hear but instead being the reality they must now face, the age of liberalism on the Supreme Court has now come to a rightful end for it’s liberalism that is America’s greatest enemy from within…with said liberalism having been adjudicated from the bench. And while the Supreme Count’s job is solely to interpret the law as laid down in the Constitution, unfortunately time itself has shown that what a justice holds as his or her personal ideology and politics does more times than not sway said justice’s vote. And in today’s political climate of the left hating any and everything Donald Trump, the overt political ideology and now agenda of some justices has proven to be a very dangerous thing indeed. Take for instance the Supreme Court’s recent 5-to-4 vote to uphold President Trump’s temporary travel ban. In their decision the court’s five conservative justices rightfully stated that Trump’s power as president to secure our country’s borders “had been delegated by Congress over decades of immigration lawmaking”…which in fact it has always been…and that said delegation was not being undermined by what was then-candidate Trump’s “incendiary statements” concerning the dangers he claimed muslims posed to our country…which was the basis for the liberal justices ruling against the travel ban. In fact, during oral arguments before the bench, Obama appointee Justice Elena Kagan personally tired to “swing” now retiring Justice Kennedy to vote against Trump’s now for the third time amended travel ban by depicting the case as a “watershed moment” in the High Court’s jurisprudence about bias by laying out the possibilities of ‘what if’ an overtly anti-Semitic person became president and banned all immigration from Israel. Ignoring the fact that ‘what ifs’ are not now nor have they ever been constitutional law…and really why pick Jews who have contributed much to the fabric of our American society when she could have picked any number of minority groups…saw Kagan in her argument trying to play what in reality was the Obama anti-Israel, anti-Jew card…perhaps even allowing a glimpse into her own possible anti-Semetic and anti-Israel bias to show through. Talk about an activist judge of the first degree. In fact, the great conservative Justice Antonin Scalia…a true “originalist”…stated time and again that “the text of the law speaks for itself”…something that all Supreme Court justices need to not only take to heart but to apply in all their decisions made. “I do not ask about a nominee’s personal opinions…what matters is not a judge’s political views but whether they can set aside those views to do what the law and the constitution require.” So said President Trump when queried if he would ask his possible Supreme Court nominees their personal opinion on abortion. And that brings us back to now Supreme Court nominee Brett Kavanaugh, and to what the Democrats consider the most critical issue of the day…their fear that the High Court with Kavanaugh sitting on the bench would surely overturn Roe v. Wade…the highly contentious 1973 law making a women’s right to choose legal…making abortion legal…in these United States. And with Democrats ignorant to the fact that abortion is but only one of many critical issues facing our nation today, I personally do not think Roe v. Wade would be overturned…. amended maybe but not overturned…for the simple fact is that it’s a settled opinion with precedent already having been set. And while a lot of conservatives would like to see it overturned based upon their religious beliefs alone, only Justice Clarence Thomas has publicly stated that he would like to see v. Wade overturned. In fact, Judge Kavanaugh, a true “originalist” in the mold of Antonin Scalia, himself has stated that he would not vote to overturn Roe v. Wade based upon precedent already being set. But now some key Democrats are saying that while Kavanaugh was serving as a D.C. Circuit Court judge he had to honor the precedent of the Supreme Court, but that as a sitting High Court justice he actually would not have to. However, during his 2006 confirmation hearing to said Circuit Court, Kavanough clearly stated that, “if confirmed to the D.C. Circuit, I would follow Roe v. Wade faithfully and fully,” and no words that he has spoken or written concerning Roe v. Wade since then has proved otherwise making the Democrats fear of his flipping nothing but a Justice Kagan previously stated ‘what if’ scenario with ‘what ifs’ being mere conjecture not fact. And besides going against widespread public opinion about abortion is not something that any sitting justice is likely to do…and you can see where Americans stand by the numbers regarding abortion in my recent article On Abortion…because sitting justices truly are leery to overturn settled precedent and disrupting public expectations especially when doing so might imperil the legitimacy of the Supreme Court. So what do Democrats fear most regarding a Kavanaugh appointment besides his possibly changing his stance on Roe v. Wade…his past record voting record, his possible future voting record, and especially his opinions written coming back to haunt them. Remember, while on the appeals court Kavanaugh voted to strike down environmental regulations and said he would have overturned internet regulations issued while Barack Obama was president. Kavanaugh also dissented a ruling that let an undocumented immigrant teenager get an abortion while in federal custody. And Democrats now fear that Kavanaugh would vote to rescind the protection of pre-existing conditions under ObamaCare, which the Trump administration is no longer defending in a lawsuit launched by GOP attorneys general. And they especially fear Kavanaugh’s past opinions on whether a sitting president can be indicted in a criminal investigation and how that would impact Mueller’s ongoing Trump/Russia collusion what amounts to a ‘witch hunt’ investigation. Translation: Kavanaugh might vote to throw Mueller’s entire investigation out if it ever reached the Supreme Court. So where do we stand right now as we anxiously await the nomination hearings…Democrats will surely try to put Kavanaugh, a supporter of broad presidential powers, on the spot regarding how he would vote on upcoming future cases like of course Roe v. Wade, the always hovering ObamaCare, and would he side with what the Democrats call corporate interests against the working people. And we also need to see how three Democratic Senators…Joe Donnelly of Indiana, Joe Manchin of West Virginia, and Heidi Heitkamp of North Dakota…all of whom voted to confirm Neil Gorsuch and who are all running in difficult reelection campaigns in red states…will vote. And with Schumer’s goal being to keep his party in partisan lock-step line it surely will be fun to watch the Democrats squirm as the High Court shifts decidedly to the right for decades to come for Brett Kavanaugh will be confirmed when all is said and done leaving the Democrats to cry that their dream of a legislated from the bench socialist utopia is forever relegated to the trash heap where it always belonged. For more political commentary please visit my RIGHT SIDE PATRIOTS partner Craig Andresen’s blog The National Patriot to read his latest article Kavanaugh…Because Elections Have Consequences. Today, Tuesday, July 17th from 7 to 9pm EST on American Political Radio, RIGHT SIDE PATRIOTS Craig Andresen and Diane Sori discuss everything SCOTUS… ‘Shifting the Supreme Court Decidedly to the Right’; Kavanaugh…Because Elections Have Consequences’; and important news of the day. Next articlePutin’s In Da House!